I didn't enter, but I felt like I could share for inspiration and motivation. First picture I was hovering at 270. So I've continued eating healthy, mtn biking, and the weight continues to slowly come off. I never thought I would be below 200. Heck I haven't been under 200 since middle school. I was the guy who was 6'2" 225 in 7th grade. I now wear 32 or 33 when earlier in 2018 I was filling out 40. I'm currently sitting between 195-197. Crazy that I was actually over 270 about a year ago. The Great Pumpkin, Big Ern McCracken, AHebrewToo and 9 others like this. pennstate2012, Whiskers McKitty, AHebrewToo and 5 others like this. Whiskers McKitty, broXcore, DirtBall and 3 others like this. Have a 4 day business trip so this week is going to be hard. But the stomach flu or food poisioning that hit me this morning ought to help with the weight loss. broXcore, DirtBall, devine and 3 others like this. DrunkJester, broXcore, DirtBall and 1 other person like this. I've visited the throne a dozen times today, including on a plane. I'm going to have a record week next weigh in. DrunkJester, broXcore, john fairfax and 2 others like this. DrunkJester, devine, rv12 and 1 other person like this. 240.8 and I am absolutely shocked. I was positive I gained. I have a new lady friend and she likes to feed me. DrunkJester, devine, dukebuckeye and 3 others like this. 186.2. I’m coming for 185 next week. DrunkJester, Gunners, devine and 4 others like this. Too scared to weigh this week. DrunkJester, Gunners, dukebuckeye and 2 others like this. 246.6, so down but barely. Workouts have been good but diet needs to rebound a little after a tough week at work last week. DrunkJester, Gunners, DirtBall and 2 others like this. AHebrewToo, JeremyLambsFace, DrunkJester and 4 others like this. If I didn’t go get drunk on Saturday and eat different than normal yesterday (I also didn’t hit the gym either day because of rest on Sat and beyond hungover yesterday) I may have hit 10lbs. Still happy of course with another 6+ off the scale. I also now have one weekend where I’m going to Atlantic City and other than that it’s just healthy eating and healthy habits. 81 days until the final weigh in. Ideally I’d like to be down to 290lbs or less. Let’s do it. Arkadin, DrunkJester, Gunners and 4 others like this. 222. Another weekend with my nephews and Super Bowl. Way over did it for the Super Bowl, felt like complete trash all day. AHebrewToo, marcus, DrunkJester and 2 others like this. marcus, rv12, DrunkJester and 3 others like this. Down to 249. Super Bowl weekend was rough rough rough. marcus, BRC and DrunkJester like this. We had a little guy lead change. H/T and wes tegg, make sure y'all weigh in this week. mal630, technically you've already had three strikes in a row, but if you weigh in this week, all is forgiven--gotta weigh in this week though. Welp. Took a nice poop. Chugged a pot of coffee and got a nice 45 min stair routine in. Feeling better. Will see where I’m at in the morning. DrunkJester, rv12 and dukebuckeye like this. DrunkJester, rv12, Goose and 3 others like this. DrunkJester and AHebrewToo like this. I'll reweigh with a picture after my run today for you babe. Goose, DrunkJester, DirtBall and 4 others like this. Down 1.4lbs since last week. 13lbs since we started. DrunkJester, rv12, JeremyLambsFace and 2 others like this. I'm doing better on my step counter goals. came across this guy in another thread, thought i'd share.. I'm starting to notice my waist and abs having more definition/curvature. That 'V' is starting to show itself again around my hips & lower belly. I'm lifting more weight and feel stronger. Definitely feeling good about myself. 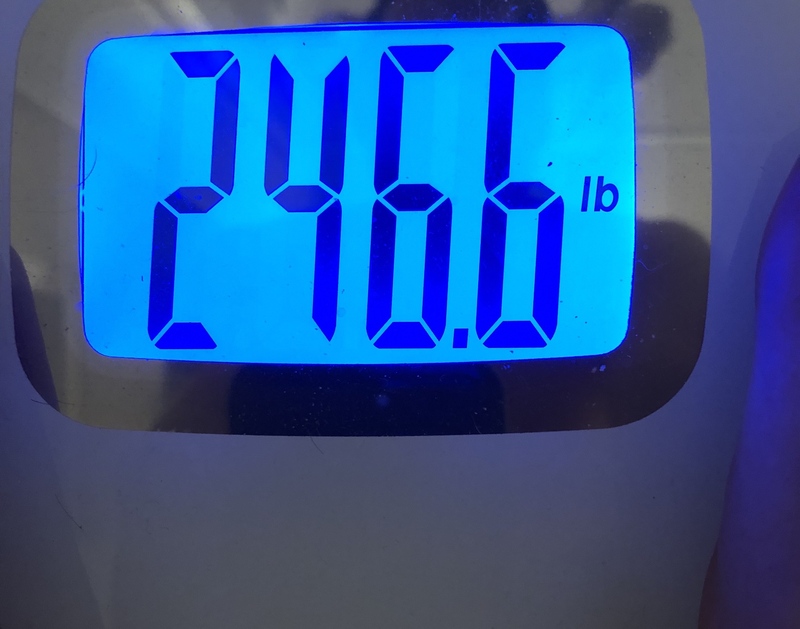 Haven't weighed myself since lat Friday (206.2) because I went crazy on Super Bowl Sunday, but I got right back on my diet and workouts the next day. I'd love to be at 203 this Friday. DrunkJester, marcus and Ian Boooooo!k like this. The Keto thread isn't going to like this. Gotta get a weigh in soon. Sorry been a long two weeks. I've had a lot of travel for work, then my one month was admitted to the children's hospital for three days (Everything good now) and then just recently found out I'm being relocated back to Myrtle Beach for work when I've only been in Atlanta since September lol. So stressful time. DrunkJester, dukebuckeye, rv12 and 2 others like this. DrunkJester I am traveling through next weekend and won't be at my home scale until then. The rules say I must weigh in each week, but also say I will be disqualified if I don't weigh in for 3 straight weeks. I just want to confirm that I won't be disqualified if I don't weigh in for a single week. The rule just says I will be disqualified if I miss for 3 straight weeks, but doesn't say whether I will be disqualified if I miss 1 week. I will find a Bed Bath and Beyond and use their scale if I have to. But I'll either have to weigh in with clothes on or risk prison. I have eliminated AHebrewToo from the competition. Anyone else wanna try me? Goose, DrunkJester, JeremyLambsFace and 2 others like this. DrunkJester, JeremyLambsFace, dukebuckeye and 1 other person like this. 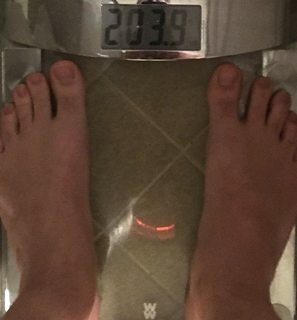 Checked in at 205.2 this morning. I’ll take it after my glutinous super bowl Sunday. Down 1 pound from last week. Down 6.1% for the contest. DrunkJester, rv12, scatman duse and 1 other person like this. DrunkJester and dukebuckeye like this.